Arnold Spohr was born in December 1923 to German immigrant parents in Rhein, Saskatchewan, not far from the border with Manitoba. He was the fifth of seven children and grew up speaking both English and German. Arnold’s father, George Spohr, was a pastor, and he not only placed a lot of importance on his children’s bilingualism and literary education, but he also supported their artistic and musical abilities. In addition to his excellent general education, Arnold stood out particularly because of his skills on piano and his athletic successes. Because of his passion for sports, he got his qualifications to become a gym teacher upon completion of his studies. Arnold’s love for ballet was kindled when he accompanied his sister to a performance by the Ballet Russe de Monte Carlo while he was living in Winnipeg. Arnold joined the Royal Winnipeg Ballet in 1945, where he danced for many years before taking over as Artistic Director in 1958. In his thirty years at the job, he led the Royal Winnipeg Ballet through difficult economic times and helped them earn their current excellent reputation. His intercultural upbringing and his trips to Europe inspired and motivated him to invite internationally recognized ballet companies to the prairie city, expanding Winnipeg’s cultural offerings. As the director emeritus, Arnold Spohr remained connected to the Royal Winnipeg Ballet even after retirement, helping Bengt Jörgen to build up the Toronto-based company ‘Canada’s Ballet Jörgen’ while in this role. For his untiring work and strong commitment to the arts, Arnold Spohr was made a Companion of the Order of Canada and awarded the Order of Manitoba, the Centennial Medal, and the Governor General’s Performing Arts Award. In addition, he received three honourary doctorates, as well as many other prizes and recognitions. 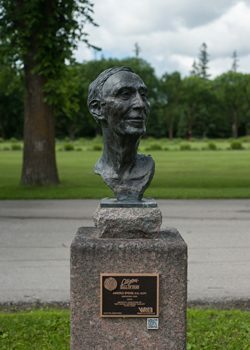 Arnold Spohr devoted his life to ballet, and he was recognized for his accomplishments as a dancer, choreographer, and director both in Winnipeg itself and internationally. His work shaped the ballet world of the 20th century, and it continues to influence it to this day. Arnold Spohr died peacefully at the age of 87. 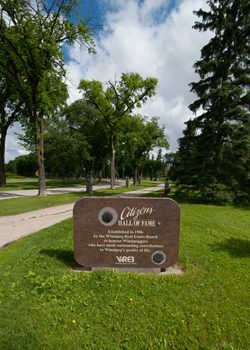 For the city of Winnipeg, preserving his legacy is a point of honour - after all, it is thanks to him that the city today boasts a world-famous ballet company, which enjoys an extraordinary reputation. The statue erected in his honour fits in perfectly with the Citizens Hall of Fame, a collection of statues of prominent figures from the provincial capital.